By Singyin Lee in Social Media. Updated on December 1, 2016 . What won’t WhatsApp share with Facebook? 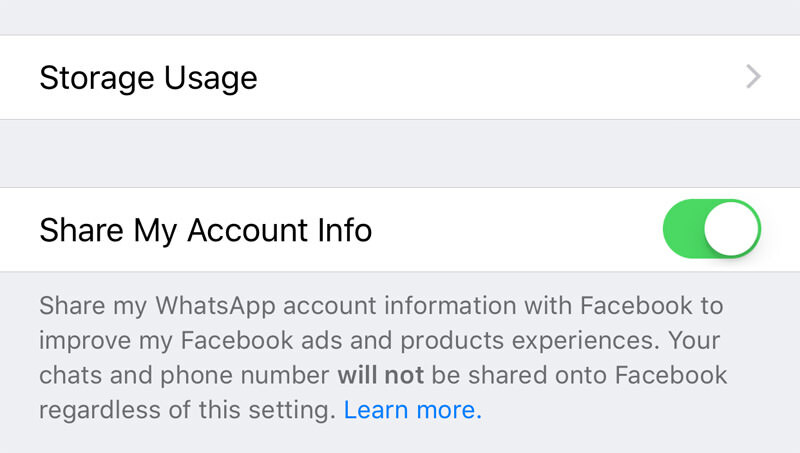 Facebook will be getting the phone number you verified with WhatsApp and track how often you use their services, and the last time you used WhatsApp. WhatsApp insists that messages, photos and account information will not be made available to Facebook, falling back on their recent move in making messages encrypted end-to-end (provided you update to the latest version) as “proof”. Note that WhatsApp still insists that they "won’t post or share your WhatsApp number with others, including on Facebook" and "won’t sell, share or give phone numbers to advertisers". Why does Facebook want my WhatsApp data? The reason given is because WhatsApp is a part of the Facebook family of companies and that this exercise will allow them to improve the services of both WhatsApp and Facebook. With the data they retrieve, they claim that they can more accurately count unique users, fight spam and abuse. What’s in it for us? "Better suggestions" and "more relevant ads on Facebook" — as in you’d see an ad from a company you’ve already worked with than one you have not heard before. Then again, this begs the question: isn’t advertising supposed to be to expose customers to services they have not heard or use before? Well, whatever the reason is, this has to do with Facebook ads. There are two things you can do, right now: Opt out of this sharing alliance or dump WhatsApp for an alternative messaging app. 1. How do I opt out of WhatsApp sharing my info to Facebook? At the Policy Page, tap Read so that the rest of the policy expands. At the bottom of the screen, there is a box that is already ticked. If you don’t want to share your WhatsApp data with Facebook, untick the box. You still have 30 days to opt out of this sharing attempt. Go to Settings > Account > Share my account info, and again, untick the box. 2. Which app should I leave WhatsApp for? It depends on if you really want to leave WhatsApp’s attempt to perfect mothership Facebook’s ad-targeting strategy. If you do, of all the options out there, Telegram is probably the safe haven you seek. Has the two check feature, in green, and an approximate last seen. Group chats can support up to 5000 members. @mention and #hashtags are supported. You can share files up to 1.5GB, which can be accessed on both mobile and desktop. The Files are also grouped together to make them easy to search. You can edit messages that you have already sent. Your account will be deleted along with any other data inside your account if you do not use it for more than 6 months. Telegram already has more than 100 million active users by early 2016. The only question left to ask is are your friends on Telegram as well?